Portable Millstone Type Concrete Mixer can be used for different projects and a solution to many problems. The most important aspect that a Mobile Concrete Mixer can bring is the flexibility of always having fresh concrete on site by the time you need it. The concrete is fresh and maximum strength every time, comparing the output of a volumetric concrete mixer with a traditional ready mix. Concrete produced by mobile concrete mixers meets standards established by ASTM 685 and AASHTO M-241 standards as well as DOT requirements. 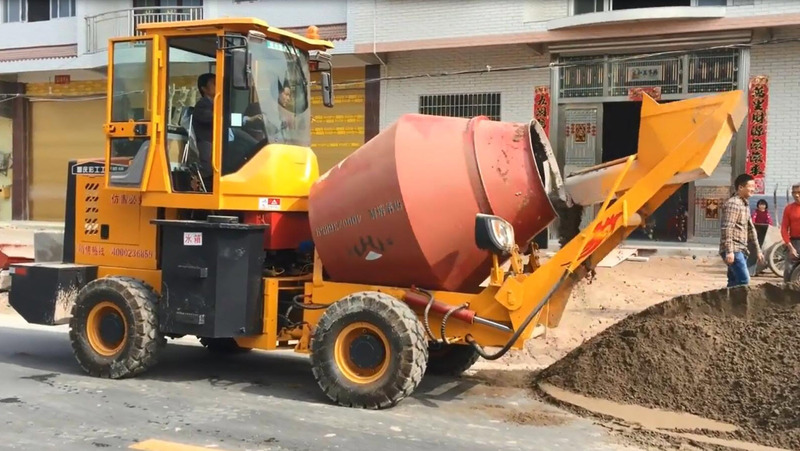 The efficient retating concrete mixer , drum type is normal used , which is just need one operator to drive, load, and mix raw material while moving it. Mobile Concrete Mixer has a higher working efficiency, higher mixing effect. At the same time, it greatly reduces the labor cost and working time. Loading: Because of hydraulic shovel, this mixer can load the material easily and accurately. Inside blade can tear the cement bag to avoid material waste. Driving cab: There is a well appointed cab. The driver can operate almost all the actions through a handle shank. Brake: Disc brake system for safe working. *Training how to install the machine, how to use the machine. CHONGQING Honggong Construction MACHINERY Co.,ltd specializes in the design, production and sale of Highway Guardrail Pile Extractor, Automatic Pile Driver, multi- Functional Highway Guardrail Pile Driver, Drum Type mobile Concrete Mixer, mobile Concrete Mixer and other series of equipment, at the lowest and most affordable price to sell, welcome to come to negotiate. Looking for ideal Self-Loading Concrete Mixer Manufacturer & supplier ? We have a wide selection at great prices to help you get creative. All the Mobile Concrete Mixer are quality guaranteed. We are China Origin Factory of Drum Concrete Mixer. If you have any question, please feel free to contact us.